An automated beverage vending machine comprises of a microcontroller which is programmed to instruct the system to serve the beverage. Machine will activate when the user insert a five rupee coin into coin slot. This coin will be detected by an IR-sensor and send a signal to microcontroller. The machine comprises of cylinder controlled by microcontroller. A fixed volume beverage is filled in the main container. The beverage is poured in the glass through tap which opens and closes after fixed time period and only activated when container is filled. Hence, the user gets the beverage demanded by him by fully automated technique. You can also Subscribe to FINAL YEAR PROJECT'S by Email for more such projects and seminar. 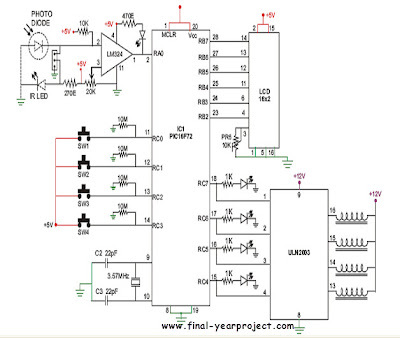 The above image shows the circuit diagram of automatic beverage vending machine. 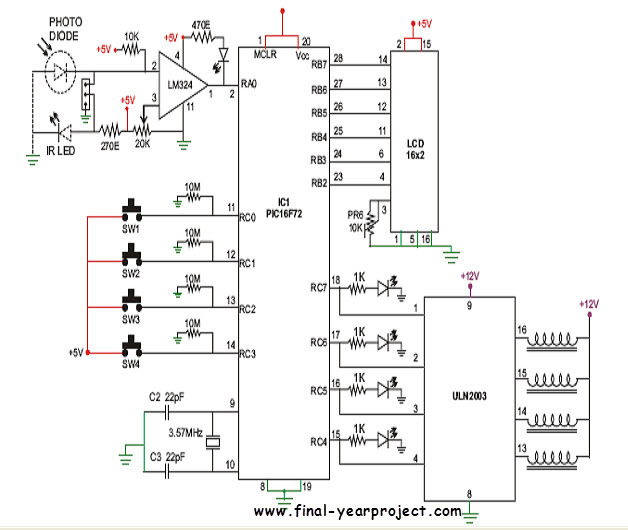 Component and resource needed for this project are Diptrace, Microcontroller programmer(burner), Hitech c compiler for pic microcontroller, Solder kit, Multimeter and Breadboard. This report also include coding of the microcontroller.